Back again by popular demand! This Limited Edition SYS-MFT-FX Set will help you get more from your MFT Table. Secure and stabilize stock for greater control during all machining steps. 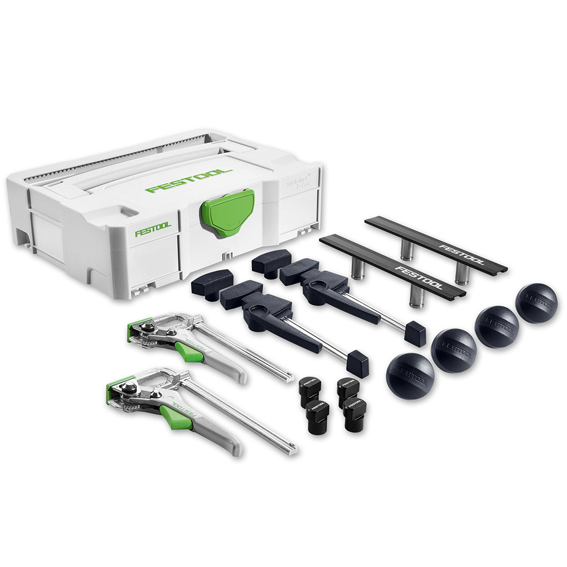 This exclusive and very limited clamping set simplifies machining tasks when combined with a Festool MFT or similar grid-hole work surface or bench. Simplify machining processes and improve results with greater material stability and security. Stability - Improve results through more efficient and strong clamping of material. The clamps in this set provide secure methods to secure stock for machining processes from sawing to routing to sanding and more. Flexibility - The clamps in this set provide a wide range of clamping options for all types of materials, thicknesses, shapes, and sizes. Efficiency - Increase productivity by always having the right clamps at hand with the variety of clamping options provided in this kit coupled with the Systainer for organization.